I know I’m a bit late posting this but I am still suffering from a lack of sleep after what was the strangest way to spend a Saturday night but I will try to convey the emotion and sense of occasion that the Moonwalk brings to all those who take part, in whatever capacity. At 8.30 pm on Saturday 12th June I dropped my good friends Kim & Joanna at their fellow Moonwalkers rented apartment in the Royal Mile – what an amazing place to stay – right in the heart of tourist land and easy access to the historical and cultural centre. I then followed their minibus to Inverleith Park where the big pink tent was waiting. I wasn’t able to go into the Moonwalk Village as this was purely for the brave souls about to embark on their marathon (or half marathon) around the streets. I decided to grab a coffee and wait for them to start at the start (and finish line). The wait was a good 2 hours but myself and the few other hardened souls that were there with me were kept entertained by a power failure to the time clock and the lights around the start point – it was literally 5 minutes before the walk started that the power was restored and we could actually see something! 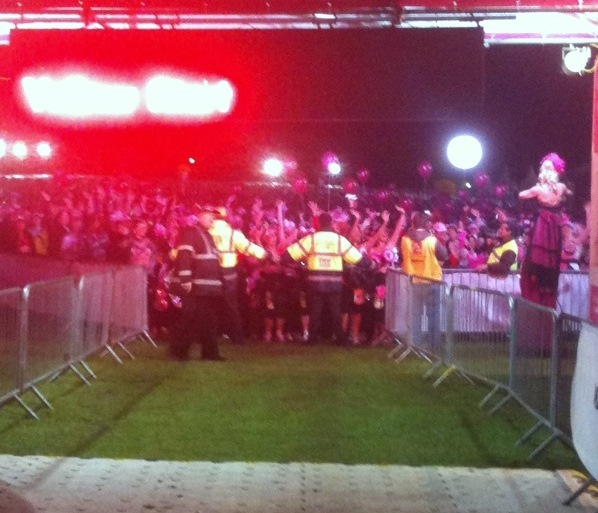 At 11.30pm the huge crowd of 10,000 walkers surged towards the start line – an incredible sight – and the 2011 Edinburgh Moonwalk was underway. The “entertainment” was a man in a pink kilt talking to the crowd as they crossed the start line (I’m thinking he must be a minor Scottish celebrity but precisely who he was I’ve been unable to find out!) and some people on stilts – not sure what that was all about! With a huge lump in my throat I went back to the car and began my epic night as support vehicle to my pals who had ordered hot coffees at the halfway point if possible. I hadn’t really thought this through – with this number of people let loose on the streets of Edinburgh in the wee small hours – would I ever manage to catch up with them during the walk? I decided to check out the area around the 13 mile mark, only to discover that this was around Silverknowes Golf Club and the road had been blocked off to traffic. Now this isn’t a part of Edinburgh that I am particularly familiar with so I back tracked to the nearest water stop and asked the volunteers there whereabouts in the walk I was. They assured me that this was just past the 12 mile mark and that the first walkers were expected at around 1.40am. I found a parking spot and prepared myself for a long wait. Sure enough at around 1.40am the first few superfit athletes began to pass me. I was amazed to see that one of the front runners was actually walking in heels – bet she regretted that the following day! During all the time I was waiting my friends, Kim & Joanna, were keeping in touch via their mobiles and I let them know that I would meet them with steaming hot coffee at the 12 mile point. They were only 8 miles in at that point so I knew there would be a longish wait. At 3.00am I called to check where they were and they said they’d just passed the 12 mile marker. Panic set in. I’d promised them hot coffee and hot coffee is what they shall have! I screeched off at the top speed my borrowed Corsa could manage and headed back to the Shell garage at Maybury where I was now becoming a familiar face at the coffee machine. Three steaming cups of coffee on board, I headed back to my vantage point, only to discover that I’d missed them by literally 30 seconds and they were now on that road which had been blocked to traffic! I was a woman on a mission! What could I do and, more to the point, where was the next best place to catch them up? Checking the rather useless map that the organisers had provided, I decided that Granton seemed like a good bet and, bearing in mind there were the rest of the 10,000+ walkers to negotiate, I was back on the road in no time and heading for Granton. Pulling up by a bit of waste ground, I was able to park and ask one of the walkers how far in they were. 15 miles was the reply so I knew I had a bit of a wait but at around 4.00am there they were – cold and tired but still in one piece! With (the now) lukewarm coffee consumed they continued with their walk – more than halfway through but the sun had risen by this time and they were on the final leg. All I could do now was head back to the finish line and wait. With 4 hours to kill (and only a John Grisham for company) this seemed like the longest part of the night by far but eventually, at just after 8.00am they arrived back and their marathon ordeal was at an end. I watched them cross the finish line through a sea of tears – both happy and sad. I am so proud of each and every one of the good people who took part in the Moonwalk, whether they walked the distance or were volunteering throughout the night. I am especially proud of the breast cancer survivors who took part (yes, I mean you Jane and all the others!). I was bursting with pride when I saw Kim and Joanna – I love you both! As most of you know, I am a breast cancer survivor – 8 years and counting. Please give generously whenever you can as your money goes to help people like me have better chance of survival. Thank you. 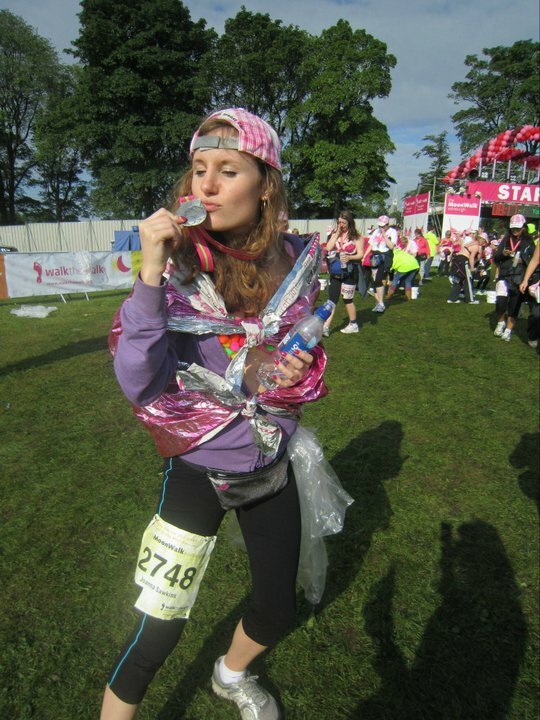 Posted on June 16, 2011, in Edinburgh, Moonwalk. Bookmark the permalink. Leave a comment.